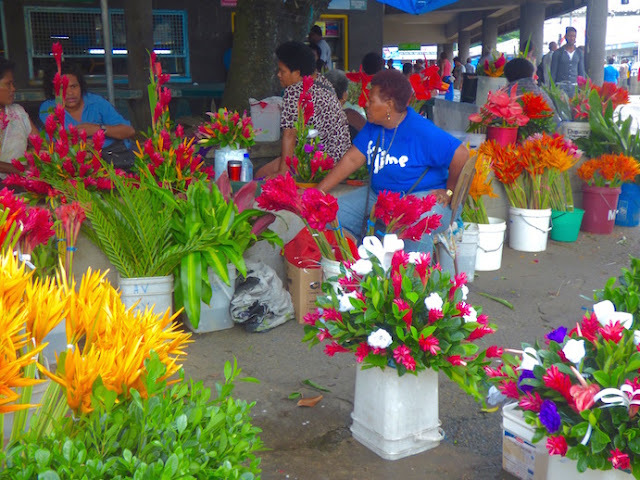 Flower ladies, Suva Central Market. Unlike in Polynesia, no Fijian fragrant leis, nor fresh flowers for the hair were available, only flower arrangements. Wandering Suva’s immense produce market is a wonderful albeit a bit overwhelming experience. The equivalent of a large city block, it’s jam-packed with produce vendors, their goods piled high… taro roots the size of a toddler, oranges stacked in gravity-defying configurations, trios of chubby cucumbers, a gaggle of greens, pint-sized eggplants, miniature mango-shaped watermelon…. A few butcher shops flank the outside. Off to the side, there’s a few handicraft alcoves. Scattered throughout, food stalls sell salads, curries and a melange of other hot and cold prepared snacks and meals, ranging from $1(fifty cents USD) to $6 Fijian ($3 USD). Upstairs kava* roots, the obligatory village chief “gift” for sevusevu is sold (more on that in a future post). 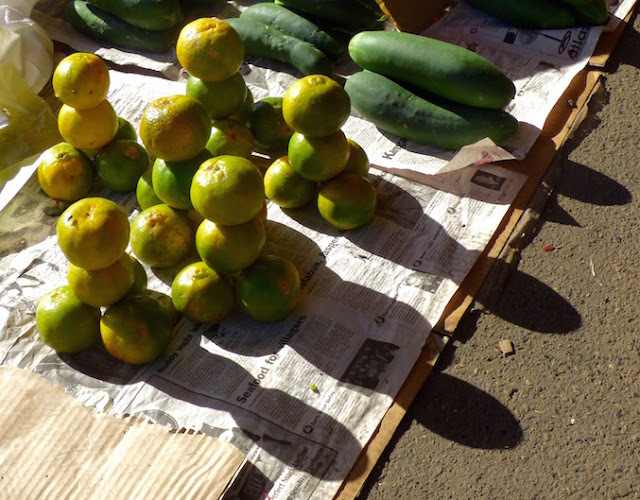 Typical gravity-defying orange display configuration at Suva Central Market, Fiji. *note: Fijian kava prices are currently higher than noted (in Suva), purportedly due to damage from the recent Winston cyclone. I paid $100 (Fijian) for five 1/2 kilo bundles, though the first vendor I encountered wanted to charge me $35/bundle. While you gotta watch out for wheelbarrows barreling through the market, seems it was siesta time for this set. 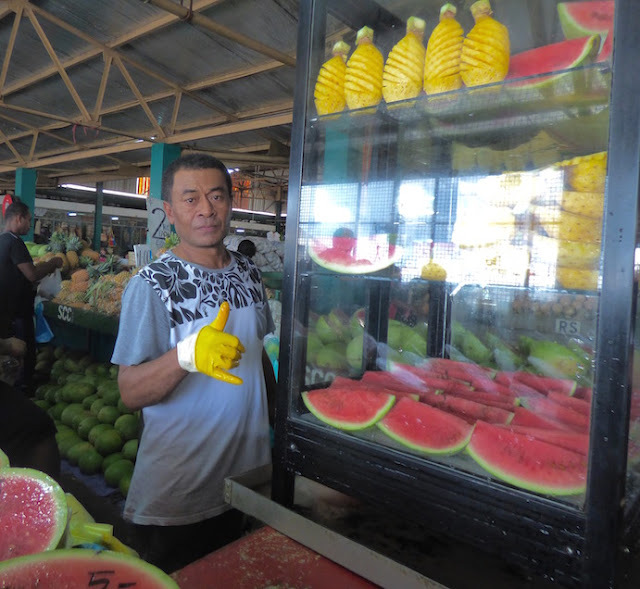 Once you engage with a produce vendor, they assertively suggest additional purchases, proffering them up, one at a time. Thus, we found ourselves leaving not only with the tomatoes ($6 Fijian) which prompted our stop, but also with scallions ($1 Fijian), 3 large cucumbers ($2 Fijian), some miniature green bell peppers (“capsicum” $?) and a beach-ball sized pile of moca, which passes in the islands for spinach ($?). Fiji: Small slice of Suva’s Central Market. 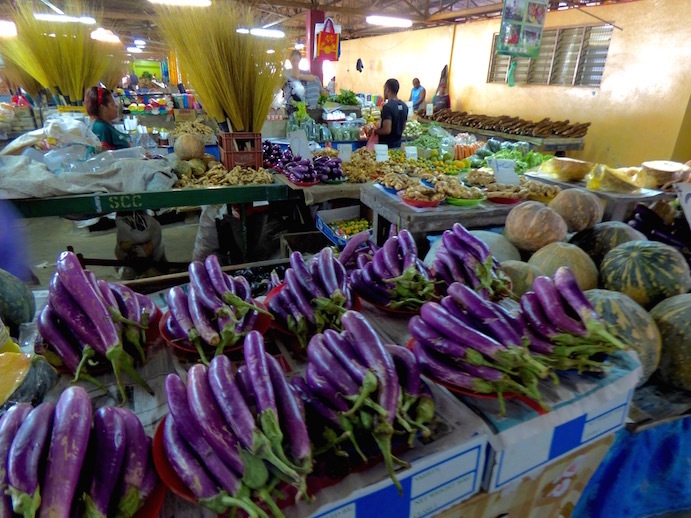 Eggplant, the purple jewel of Fiji, grow prolifically. Suspect my eggplant repertoire will expand, as they're cheap, too. A bit dazed, we paid and moved on. In our confusion, we unintentionally underpaid and didn’t realize it. We discovered this as a moment later, the vendor chased us down. While it appeared the add-ons exceeded the $10 Fiji (about $5 USD) we paid him, we weren’t quite sure by how much. Whilst Wayne held out his palm with several coins dollars worth of Fijian dollars, saying “Take what we owe,” we were being berated. 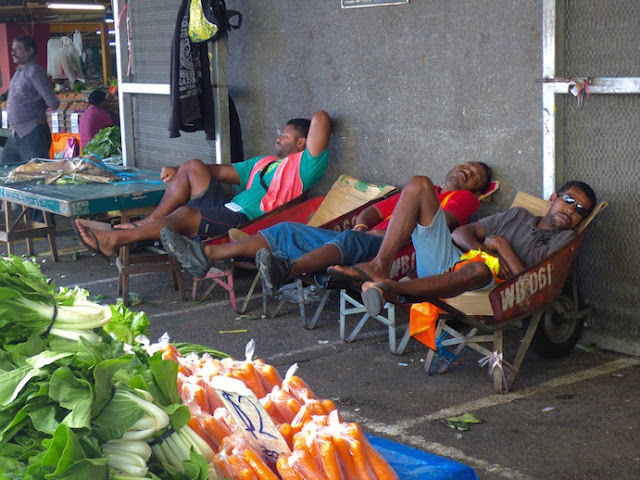 Continuing to chatter angrily away in Fijian, eventually the vendor took a portion of what Wayne held out and left. This gent at Suva Central Market offered delicious watermelon and even better pineapple slices. But what the heck was I going to do with the gargantuan bundle of spinach? My goal was to reduce it into something edible as it was taking up a large portion of my tiny galley. I ruled out warm bacon spinach salad as the New Zealand bacon I had tended to exude little fat, but instead made the pan sticky with its honey-cured coating. I ruled out my favorite low-fat spinach dip as it called for a lot of cottage cheese. We’d used our cottage cheese up and there was none to be had in Fiji. I considered a sauteed spinach side (olive oil, garlic, onions, sauteed spinach and a dash of lemon juice at the end), but all the mains to serve it with were frozen solid and not quickly thaw-able. Moca, a Fijian spinach stand-in casts its bountiful leafy canopy over Suva Central Market shoppers. Then, googling, I found a non-basil spinach pesto recipe…. Making it, I noted this “spinach” gave the pesto a little bitterness. Also, I wanted a bit more protein, thus improvised a Mediterranean Protein Kick (recipe for my addition follows). A definite do-over if we find ourselves again deluged with an overabundance of spinach and still possess parm cheese and walnuts. As the “spinach” (moca) purchased in Suva market had a bitter edge to it, I added this to the spinach pesto to give pasta more bulk and oomph, protein and a little more sweetness. It helps that I was well stocked from New Zealand and Cost U Less (for cheap artichoke hearts and kalamatas), just outside Suva. Heat a large nonstick saucepan over medium heat. Add olive oil and chopped onions. As onions become transparent, add the minced garlic. Cook one minute. Add the chicken. When the outside of the chicken becomes cooked and the chicken begins to stick a little, add the sherry. Reduce the liquid to half, then add the olives and artichoke hearts. Cook until the chicken is cooked through the liquid is mostly absorbed or steamed off. Stir in the pesto, heating it only until it’s warmed. Emboldened, to use up the rest of the moca, I made our favorite gluten-free crust less spinach pie*, this time bravely substituting a mix of plain Greek yogurt and cream cheese to stand in for the 16 oz of cottage cheese. Worked well! I will most likely mix my remaining pesto (in my zeal to reduce my spinach mound, made more than the recipe) with Greek yogurt for a dip. *let me know if you'd like the recipe. 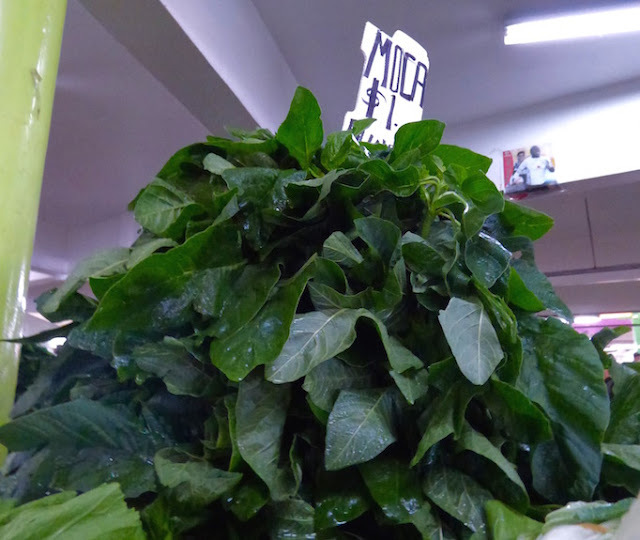 What would you make with mounds of slightly bitter "spinach" for a $1? 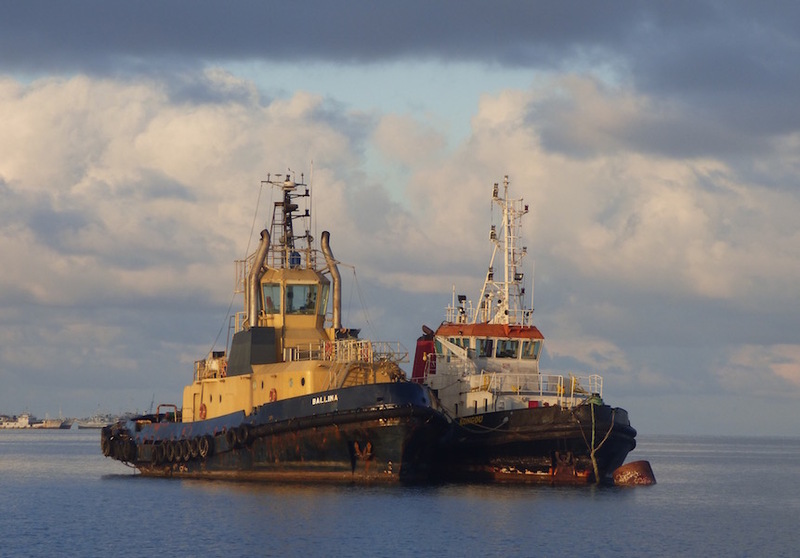 anchored near us in Suva harbor, Fiji. 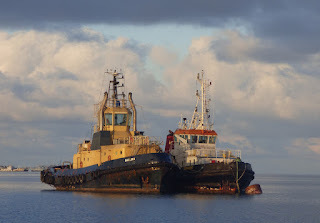 As of May 27, 2016, we’re anchored off Suva, Fiji’s capital city (S35.18.772 E174.07.485), Next up, 3 stops in Fiji's Astrolabe Reef; this will likely put us out of wifi range for at least a week. From there, our Fiji travels will likely include Levuka (back on Viti Levi), Savusasu and this island of Vanu Levu, off to the Yasawas, then back to Lutoka on Viti Levi to check out. 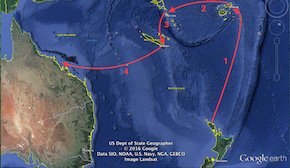 Roughly, this year's route: New Zealand - Fiji, Fiji-Vanuatu, Vanuatu-New Caledonia, New Caledonia - Australia. ~4,500 South Pacific nm. Last year, between December 2014 and November 2015 we sailed from Florida USA to New Zealand, over 10,000 miles. This year, we began our cruising from New Zealand's Whangarei, back through the Bay of Islands, then ~1,100 miles to Suva, Fiji. We plan on spending no more than 2 months in Fiji, to allow more time for our next country, Vanuatu. After Vanuatu, we’ll stop briefly in New Caledonia, then proceed to Australia by November, where we plan to sell our boat. After we arrive in Australia in around November, completing another 4,500 or so miles this cruising season, we plan to sell our boat. Then, it's back to work, somewhere.